In the past I’ve written about how special CH cats are — and how they’ll inevitably change your life. I’ve shared countless tips and tricks from my own learnings and from others in an attempt to improve your cats’ lives and your sanity. 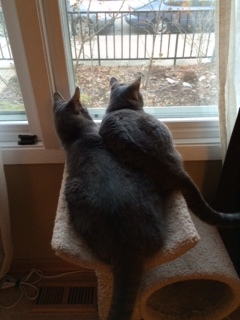 And now, more than five years after adopting my first CH cat, I thought it was about time to sum up how our two CHers have changed our everyday lives. I wanted to write a piece that would be essential for folks who were thinking about adopting a CH cat; a piece that new CH cat parents could turn to. I thought and thought about it, and I came up blank. I even discussed it with Matt, feeling discouraged that after all we’ve lived through, I couldn’t think of a handful of obvious ways that our lives have changed for our special needs cats. But then he reminded me of the obvious. Since the first day I brought CG home, we’ve been making small changes to accommodate his needs. Over time, those have added up, but they’re no longer changes to our routine — they’ve become a part of our every day routine. Things that once seemed like special accommodations are now normal. I know CH cats come in all shapes, sizes and severities, but I hope this realization gives you hope. Granted some households will certainly be different, but I think the biggest change we experienced wasn’t in our every day life, but in the changing of our minds, rethinking what “normal” could be. – Having climbable furniture: Our cats don’t jump, they climb. So if they want to get somewhere, it’s up to us to make sure that they can. We’ve been very thoughtful about our furniture purchases, from purchasing a cat-tree that both cats can climb without too much trouble, to putting time into deciding on the best type of fabric we should have on our new couch in an attempt to minimize the wear and tear that naturally come with cat claws. – Function over form: As mentioned before, if you ever get a glimpse of our bed on this blog, you won’t see any pretty pillows or a delicate duvet on it. We’re pretty CH-focused in our room, which means our bed has an easy-to-climb blanket over it, and our box spring and mattress are actually on the floor. This lets both cats get on and off the bed without too much trouble. We’ve learned to take similar opinions on other items throughout our home, too. – Giving them a boost: We’ve also found ways to help the cats get to where they need to go. In our room, we have a small cat cube/cylinder that CG (usually) uses to climb onto the bed. Like a set of pet steps, it was our goal to help the cats get on to and off of our bed easily. 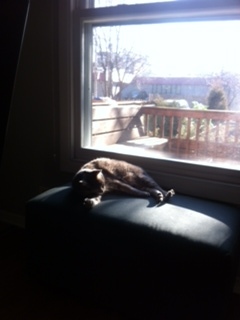 Along those lines, we’ve also purchased an ottoman for our dining room so our cats can easily look out the back window. nervous when my husband and I bought a home with stairs. Thankfully, both cats are rather capable with our stairs now after a year’s worth of practice, but I think that’s also mainly due to our stairs being carpeted and the pet gate we’ve installed at the top of the stairs as an extra precaution. 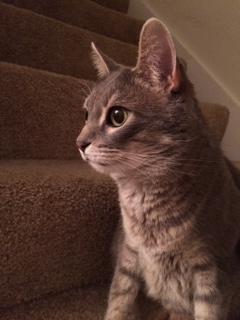 – The stair trifecta: I think our stairs are friendly for our CH cats because of three things: The pet gate at the top of the stairs, the fact that the stairs are carpeted, and because at the bottom we now have a landing mat. Suggested by a reader, this landing mat has actually made a big difference in how Ellie has been able to get downstairs safely without wiping out. – Copious floor coverings: Along those same lines, there’s nothing like adding some texture to your floor to help your CHer out. We have a number of area rugs on our hardwood floors, which help our CHers a great deal. It’s amazing to see the difference in their mobility when they move from a carpeted area to one that’s hardwood! – Cut back on the mess: Our CHers are messy. From spilling water to food to litter, there’s always something to wipe/sweep/vacuum up. While I can do big cleanings on the weekend, it helps to find quick fixes to contain those messes during the week. For example, we have trays under our food and water bowls (which are constantly spilled), so if water or food is knocked out, it’s contained. No need to run for a towel right away. It can wait. Similarly with our litter boxes, I have a small area rug (2×3 feet) in front of them to catch litter that’s tossed out. It doesn’t catch all of it, but it does a good job containing most of it day to day, which I can then dump back into a litter box. The funny thing is these changes really are small, but they can make a big difference in our cats’ lives and in our day-to-day lives. They just don’t seem like changes any more, and that’s so cool. And at the end of the day, I’ve come to see our cats are like any others. As I write this, Ellie has gone rogue on my desk. She has knocked over a roll of paper towels and is batting off the sheets, creating a pile of unrolled, crumpled paper towels. Typical cat behavior, huh? The only difference is in a minute I know she’ll topple over and I’ll pick her up, give her a big hug and kiss, and let her know it’s OK. Just another day in our house! Hi, Amanda, nice piece; I enjoyed your summary of how your CH’ers changed your daily lives. I completely relate to the way that with time, special accommodations begin to integrate themselves into the status quo. Together, Elvis and I are more than the sum of the two of us. There is an unspoken pact that both defines and enlarges us. Elvis is independent and fearless. I am protective but more relaxed now. I know that he can flip completely over while making a mad dash after a friend, and not mind at all. make no mistake – Elvis depends upon me utterly. It is my job and my blessing to see that he never knows that, not because it would diminish him, but because it would inflate me. By our love, we are both better than before. That’s how my CH’er changed my life. Great article, I do most or all of those things for our CH cats too. As you said, it becomes normal in our routine. Bottom of the stairs landing pillow was one of the first things we did. Even my Mom did some woodworking and built a set of steps up to a window perch for her CH cat. I made short cat tree/condos so my guys only have to jump up a foot at a time.